JUNE 6TH, 2012 (ST. LOUIS, MO) California driver Camden Geise has been piloting racing machines since the early age of five. Beginning his karting career in 2001 behind the wheel of a kid kart like so many aspiring racing drivers. He continued in karts until this year after being awarded the ‘Road To Indy’ by the Indy Racing League during his last racing season in karts. Currently Geise sits second in the Pacific F2000 Championship standings. 2012 marks a new challenge for sixteen year old Geise, making his debut in auto racing as he follows the Pacific F2000 series tour. Piloting cars out of the Dave Freitas Racing stable he has already run six races at three venues. Opening up his auto career with back to back runner up finishes at Willow Springs Raceway, the top five consistency has continued since his series debut. Camden Geise Racing is excited to debut his new website to the motorsports community. Please log on at http://www.CamdenGeiseRacing.com to browse the new website. Camden Geise is now set for the fourth round of the Pacific F2000 super series. Camden’s Pacific Formula 2000 team, Dave Freitas Racing, was started in 1992 by team principle Dave Freitas with one goal in mind, winning races. The California driver currently sits 2nd in the Pacific F2000 Championship standings and is in search of his first win. With a dedication to winning second to none, the Santa Fe Springs California team is looking to win its third Pacific title this season with Camden Geise behind the wheel. Camden Geise Racing would like to thank all of their sponsors. These include; Trench Shoring Company, Dave Freitas Racing, Arties Water Truck, Mucha Ague Water Truck, DDK Water Rental and Walters Web Design. To learn more about sponsorship opportunities with Camden Geise Racing, please visit the contact page. They would be happy to go in to detail with you about how motorsports marketing can help to grow your business. Motorsports design team http://www.WaltersWebDesign.com the manufacturer of this new website is pleased to announce the new partnership with the Camden Geise Racing and we look forward to working with the team far into the future. The new driver website will be updated regularly with event changes and race results. Be sure to visit the photo albums as well for any race fans entertainment purposes. 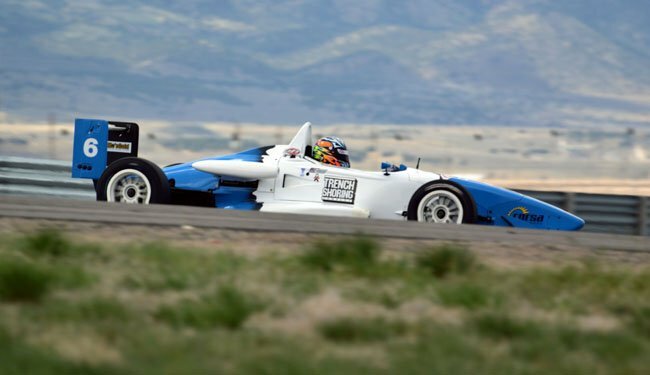 Over the past 20 years of operation, Dave Freitas Racing has secured championships in several different classes ranging from SCCA Formula Ford to the Molecule Series Star Mazda. Along the way they have also won multiple titles in Pacific F2000 and also SCCA Formula Atlantic. This season the team has put Camden Geise behind the wheel to bring home their third F2000 Championship title. Founded in 2004, Walters Web Design specializes in motorsports website development and graphic design. We use advertising and social marketing to help facilitate visitors and potential customers to all our client websites. “We take pride in all of our customer websites and we want each design to be better than our last. We feel this is what has put us above all the rest in our industry.” Walters Web Design is pleased to partner with ‘Camden Geise Racing’ for the first year and we look forward to working with the team far into the future.